रञ्जना लिपि कसरी पुग्यो चीन लगायतका मुलुक? इटालीमा नेपालीको सामुहिक चिहान, जसमा ‘भारतीय’ लेखिएको छ ! कता हराए २५० वर्ष पुराना चार पोखरी ? Captain Bed Upreti was born in the Far West Nepal. He graduated from Jawaharlal Nehru University in India and did his Masters from Tribhuwan University, Nepal. He also served as an instructor in the Nepali Army Academy. His main interests lie in aerial and underwater photography and travelling. He is a commercial pilot with an experience of flying over Nepal, India, Indonesia, Malaysia and many other countries of the world for more than 30 years. He is also an author of over a dozen books including one of the best sellers in Nepal 'Everest from the air' and '360 degree Everest from a pilot's Eye View'. 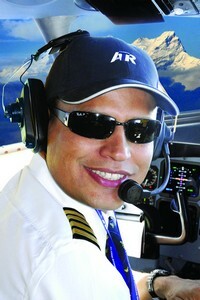 He is presently an Instructor and Examiner pilot with Wings Abadi (Lion Air) in Indonesia. He has also opened an Aircraft museum in Dhanagadi, Nepal. Currently, he is also a CEO of the Aircraft Museum.